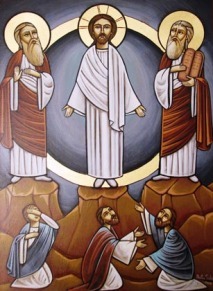 The Transfiguration of Christ appeared to some of the disciples to show them that He is neither Elijah nor John the Baptist as people say, but He is Christ the Son of the living God. To show them the glory of his Divinity before his suffering, so they would not be suspicious of Him at his crucifixion. The disciples who were with Him on the mountain, representing the Church of the Battlers’. Moses and Elijah the prophet representing the Church of the Victorious. This proofs our Church's connection with angels and the Heavenly Fathers. 4 And Elijah appeared to them with Moses, and they were talking with Jesus. 6 because he did not know what to say, for they were greatly afraid. 8 Suddenly, when they had looked around, they saw no one anymore, but only Jesus with themselves. 9 Now as they came down from the mountain, He commanded them that they should tell no one the things they had seen, till the Son of Man had risen from the dead. 12 Then He answered and told them, “Indeed, Elijah is coming first and restores all things. And how is it written concerning the Son of Man, that He must suffer many things and be treated with contempt?